Salsa is a popular form of social dance that is enjoyed by millions of people around the globe. The sensual, energetic moves that are standard in this genre of dance have a relatively short, but robust history. Read on as Elite dives into the history of salsa dance – where it came from and how it evolved into the form we know and love today! Salsa has an extremely diverse background – taking influences from African drum rhythms, Spanish guitar and Afro-Cuban and Afro-Caribbean dances. It was sometime in the 1960’s to 1970’s that salsa was first created. There is much debate on the birthplace of salsa. While the movements and style originated from the Caribbean, it was in New York that salsa got its name and started to gain popularity. As immigrants from Cuba, Puerto Rico Mexico, and South America came to New York, they brought with them their native rhythms and dances. Throughout the years, the music and moves fused and evolved into a number of popular dance styles, including the cha cha cha, rhumba, and salsa! How Did Salsa Get Its Name? Why ‘salsa’? Some people believe the dance style got its name for its hot and spicy movements, while others believe that it refers to the dance’s large mixture of influences (similar to all the ingredients that make up salsa). Still others believe that the name was based off of a cry that musicians would shout to increase the energy among a crowd. 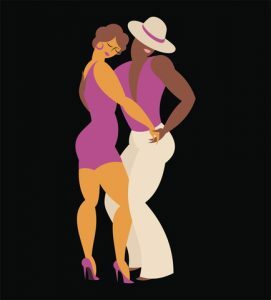 As early adopters of salsa left New York for other places, they brought the dance with them – spreading its popularity and giving rise to sub styles like Cali style, LA style and Cuban style. Salsa became a fan favourite, often appearing in nightclubs, restaurants, and festivals. The great thing about salsa, and dance in general, is that it will continue to change and evolve as people create and add new steps, lifts, and tricks. If you’re interested in learning salsa, or other latin dance styles contact the team at Elite Dance Studio. Our adult salsa classes not only cover salsa, but merengue and bachata as well.